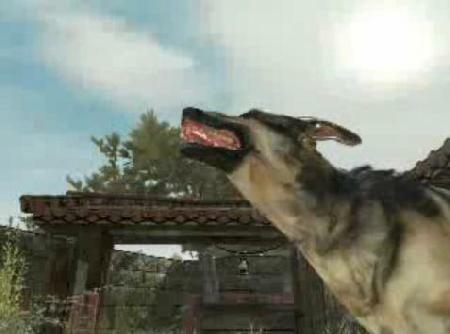 Here we go with the Animal Rights folks jumping up in defense of the poor digital dogs, so now i guess we will be seeing the dog treat perk added to Call of Duty: World at War so that the rainbow loving tree hugger's wont be forced to shoot the dogs while they are being forced to play the game. Next thing you know racing games will be hit by this crap for destroying the fake game world ozone with there fake exhaust systems, shouldn't these guys be hunting down the ones out there that have not been feeding there DS nintendog for the last few years? If you would like to know what started this little rant you can check out the article here: If you've played Call of Duty: World at War, you know how nasty those enemy attack dogs can be: They're fast, vicious and frightening. But a group of students at a Massachusetts high school are upset about the need to shoot dogs in CoD:WaW. They're taking their protest to Activision Blizzard, which publishes the best-selling game. My little 12-pound Pomeranian, Winnie the Pooh, is sitting next to [my brother, who is playing CoD:WaW], and I'm thinking, 'This looks horrible!' My brother is a sweetheart. He won't be killing dogs after playing. But some people might. I feel like these video games are dangerous for a lot of reasons. We can all rationalize and say it's just pretend. Even so, why pretend shooting people and dogs? They really desensitize kids and adults to what that violence signifies. The views expressed in the opening statements of this article are the views of a single individual and not the views of the web site.